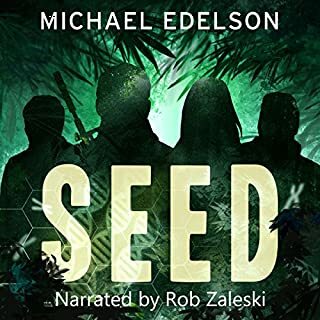 Would you consider the audio edition of Seed to be better than the print version? Yes, but I prefer audiobooks to print books, *provided* that the narrator is good. This narrator is very good. Like most of them, he has a particular way of talking. The question is, can you get used to it. In Rob Zaleksi's case, the answer is yes! And very quickly.I've read the print version before, and Rob added a dimension to my experience, he brought the book to life. My only criticism is that he's not that great with accents. Some of the characters sound nasally and his British accents need a lot of work. Fortunately there is only one British character and she doesn't say much. Rob was perfect for voicing the book, in my opinion, because Alex is the only POV character and Rob sounds exactly as I pictured Alex when reading the print version. Tom. I loved Alex, the protagonist, but when I was listening to the book (and also when reading), I *was* Alex, and saw things through his eyes, and Tom was the best. I love the concept of "ripping," I think the author invented the use of that word in that context and maybe the concept itself because I've never heard it anywhere and google couldn't turn anything up, though he clearly has some knowledge of hacking and the associated complications. I hesitate to admit this out of guilt, and it comes with minor spoilers, but it was when Alex went all terminator. I felt his rage, and I wanted that rage to be expressed with extreme violence, and Edelson didn't disappoint! Later on, when Alex shows mercy in a situation I might not have...well, I loved that part too. But I guess I'm not as nice a person as Alex, because I liked the violent scene more. Sort of. I read the book in one sitting, stayed up all night and took the next day off to sleep. So there was no urgency to listen to the audiobook that way. First, don't judge the book by chapter 1, which makes it sound like a military book...it's not. Chapter 1 just introduces the main character and sets some story point in motion...the rest of the book takes place in an entirely non-military setting. Second this is a fantastic book. It starts off with compelling characters and a very mysterious setting that makes you need to know what the heck is going on. Usually with stories like this, you are disappointed by some cliche ending, but not here. Just when you think you know what's going on, BAM, you're wrong. This happens several times in the story. Be warned though, you're not going to want to stop listening once you start. 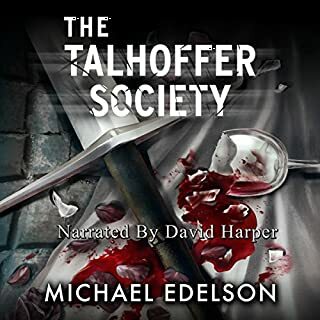 If you could sum up The Talhoffer Society in three words, what would they be? I was instantly immersed in the story, and it just kept getting better. The characters are believable and easy to identify with. There is nothing cliche here. The male protagonist is fleshed out just enough to be a sympathetic character but not so much that you can't put yourself into his shoes and see the story through his eyes. The female lead was startlingly real. I feel like I know her in real life after listening to the book. And the sword fights...amazing. I don't know anything about fighting with swords, or I didn't before reading this book, but that was no hindrance. The action is tightly woven into the story, so that every fight advances the plot. A fantastic listen from start to finish. Have you listened to any of David Harper’s other performances before? How does this one compare? No, first one. I thought he did a very good job. Not perfect, but then few are, but he is great with dialog and his accents are first rate. For reference, my favorite narrators are Jefferson Mays, Jay Snyder and Luke Daniels. They are, in my mind, the cream of the crop of audible narrators, and while this guy wasn't as good as those three, he is far better than most of the others. I'd listen to his work again without hesitation. The most important thing about him is that he doesn't take away from the story, and even enhances it. That's rare in a narrator. Buy this book! Just do it! You won't be sorry. You may even get a new hobby out of it. I'm actually considering joining a local sword fighting school.